Visite numerosos sitios históricos, desde donde despegó el primer avión comercial del mundo. Elección de varios horarios de salida a lo largo del día. 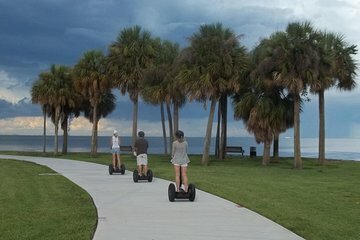 Hay recorridos a pie y hay recorridos en autobús, pero este exclusivo recorrido en Segway ofrece una perspectiva completamente nueva de la ciudad de San Petersburgo en Florida. Su recorrido comienza en North Straub Park con una sesión de entrenamiento breve pero completa para asegurarse de que todos se sientan cómodos y bien informados sobre su Segway. Se proporcionan un casco y equipo de seguridad, además de agua embotellada y audífonos de audio. En este tour de 2 horas en Segway por San Petersburgo, navegue por Bay Shore Drive, al lado de Tampa Bay, pasando por casas de estilo victoriano en el centro de la ciudad. Aprende sobre la historia y la cultura de los indios Tocobaga, que vivieron en pequeñas aldeas en el extremo norte de la Bahía de Tampa desde el año 900 hasta el 1500. Se cree que su princesa fue la inspiración para la historia de Pocahontas de Disney. Luego visite el lugar donde despegó el primer vuelo comercial del mundo: la línea de hidroaviones San Petersburgo-Tampa el 1 de enero de 1914. Vea imágenes del piloto, Tony Jannus, así como del avión que usó en ese primer vuelo. Continúe hasta St Petersburg Pier, un lugar histórico y turístico que se extiende hasta Tampa Bay. Aprende sobre su desarrollo e importancia para la ciudad y observa a los pelícanos marrones, que alguna vez estuvieron en peligro, se mezclan con los lugareños y se zambullen en el agua para comer. Finalmente, regrese a North Straub Park para concluir la gira. This is a must if you like to ride segways (or want to try something new). Doo was so great in showing us how to ride the segway and took us around St Pete to see the highlights of it’s past and future. So great ! We did Segway tours a couple times before in different cities and this time was truly unique; the city itself is amazing but the girl in charge of the tour (sorry can’t remember her name) she was absolutely perfect, she made us feel super comfortable and safe, she is so knowledgeable and kind. We recommend this tour 150% ! EXCELLENT - we were fortunate to have a private tour for our group of 5 people. The tour was excellent and fun, but the stop at Sunken Gardens was the highlight. Our Segway guide was just awesome and knew so much about the marine and plant life in the area. Great for our teen nieces as well as the adults. I would do the exact same tour again the next time family visits!! This was an excellent tour. Doo's was great and this is a worthwhile St Pete tour. Spent sufficient time on learning the Segway and she provided water. Rest stops were right on time and seeing the dolphins was additional benefit. This was so much fun. We were late getting there and Doos stayed and waited for us, so nice of her, after a brief lesson we were on our way. Very informative and a great view of the beach area, I will definitely do this again. Doo was extreemly knowledgeable about the history of the area. Made it interesting and fun to hear the history. She paced the tour just right - with enough breaks to rest legs and have some water. She could talk on other topics other than just the historic tour. Highly recommend her to anyone wanting to experience a ride on a Segway and to learn about Historic St Pete's. A must if you have kids!! !